Altair Industries offers many models of standard and custom servo, pneumatic, or hand operated assembly presses. These assembly presses are stand alone systems that can include PLC control, custom fixturing for your parts, dual "Opto-Touch" operator controls, and options such as parts counters, assembly verification, and safety light curtains. Our precision pneumatic presses offer standard strokes of up to 7", with custom strokes available up to 36" Assembly presses are available with forces from 100 - 5,000 pounds, with both standard air and air-over-hydraulic options available. Pneumatic assembly presses are good for precision assembly where one force and stroke distance is required. They excel in providing the highest cost effectiveness for single mode operations. Our line of servo presses offer unparalleled accuracy, flexibility, and cost effectiveness. 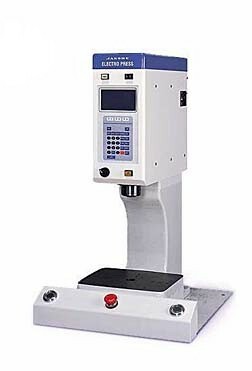 Servo presses are available in three different configurations: A stand-alone servo press, designed for line or lab use, a "Unit" model servo press with integrated control panel that can be mounted to the customer's own structure/tooling, and a "Head" model press designed for integration into automated assembly lines or equipment. Altair's line of precision hand-operated toggle presses offer low cost solutions for demanding applications in lower force (500 pounds or under) applications. 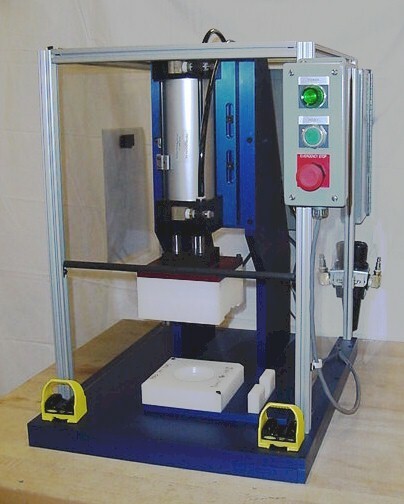 Presses are available either in a toggle-type press, which are good for shorter stroke (1/2" to 2") applications, or rack-and-pinion assembly presses with adjustable strokes, capacities, and can be supplied with end of stroke locks to assure that the full stroke of the press has been reached, and so can aid in quality control. 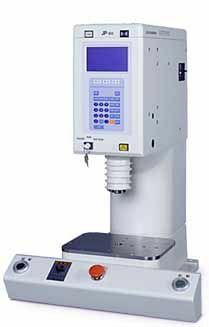 ALTAIR INDUSTRIES IS PLEASED TO PRESENT THE JANOME INDUSTRIAL EQUIPMENT LINE OF PRECISION SERVO PRESSES INCLUDING VERSIONS FOR CLASS 10 CLEANROOM OPERATION. CLASS 10 CLEANROOM SERVO PRESS. Altair Industries can evaluate your assembly requirements can provide a reliable, safe "Turn-key" tool for your production or development needs. We specialize in cost-effective solutions that perform as expected and pay for themselves quickly. Please contact us for your assembly solutions. AUTOMATED COIN PRESS WITH AUTOFEED AND AUTO EDGE DETECT, 12 FOOT LONG BUILD UP CONVEYOR. CAPABLE OF 4 SECOND CYCLE TIMES. MANUALLY OPERATED TOGGLE PRESS WITH FORCES UP TO 250 POUNDS WITH VARIABLE THROAT DEPTH AND STROKE ADJUSTMENT. TOOLED TO FIT YOUR PARTS. TWO AXIS PNEUMATIC PRESS WITH FORCES UP TO 300 POUNDS. VARIABLE THROAT DEPTH. 2ND AXIS SHUTTLES FIXTURE OUT FROM UNDER PRESS HEAD TO ALLOW UNOBSTRUCTED LOADING OF PARTS.